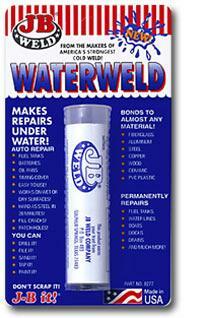 Home :: Epoxy Resin and Glue :: J-B WATERWELD 2 OZ. Plug or seal practically anything that leaks. It will patch holes and cracks, and mend almost anything that is broken. It is excellent for rebuilding or fabricating parts, and as an all-purpose adhesive for metals, wood, fiberglass, masonry, ceramics, PVC and ABS. Permanently repair holes, gouges, cuts ... even seals rot in fiberglass and wood. Cures under water. Safe for use on lines carrying potable water. We should really call this amazing product "The Miracle Welder," because you can use it to plug holes and make permanent repairs under water and in gas tanks -- while they're still leaking. No exaggeration -- this is the best epoxy putty you can use.